“I wish I had taken a picture of the look on your face,” Kathy said. “Tell me about it,” I replied, “it was literally a dream come true.” I glanced into the back seat of the car and touched the bag that held the treasure, thus reassuring myself that this was really happening. It was there alright, right next to the other local goodies we picked up while traveling the back roads of the Shenandoah Valley with Kath’s parents. There was salt and sugar-cured ham, fresh made biscuits, a strawberry-rhubarb pie, fresh herbs and flowers for the garden. I reached into the bag and grabbed hold of what was, without question, the largest morel mushroom any of us had ever seen. And we had a bag full. For the uninitiated, the morel is to mushrooms what filet mignon is to meat, what sea bass is to fish, what Dom Perignon is to champagne and what Chunky Monkey is to ice cream. Since these woodland gifts cannot be cultivated, one must search in hopes of stumbling across this delicacy. Our journey to see Kath’s parents had as its subplot a stroll through their acres of mountain-side woods in search of the elusive fungi. After making the turn to head back, Kath’s dad happened upon another market that was not on our itinerary. I strolled in and gave a quick look around at their meat and dairy section. It wasn’t until I walked over to a vegetable section that I had a “pinch me” moment. There, in an elongated plastic tray, were the largest morel mushrooms I have ever seen. Speechless, I caught Kath’s eye and simply pointed over my shoulder. The unstated agreement between us was instantaneous; yes, we could spend the rest of the day searching for our own, but we are never going to find anything like this and no one sells them for this price. Kath carefully picked through the monster mushrooms placing the best of the best in our bag that would finally tip the scales at just over a pound. Even the woman behind the register commented on my facial expression as we bagged the morels. “You looked like you were in heaven,” she stated. She then went on to tell us how her children had just picked them the night before from an abandoned apple orchard and how they were going to get to keep all of the money made from the sale. “Bless those children,” I said with visions of morels and toast, morels and eggs, morels and filet mignon, morels and morels dancing in my head. On the drive back to Kath’s parents, her dad, a morel guru if there ever was one, commented that our little detour turned out to be the best thing that could have happened that day. We all nodded in agreement and raced home to celebrate with the strawberry-rhubarb pie served with vanilla ice cream and fresh strawberries. 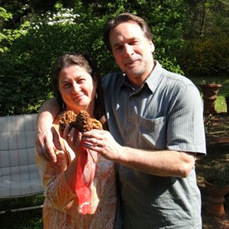 Before ending our day together, Kath’s dad took a picture of Kathy and me holding two of the prized morels. When we returned home later that evening the picture was in our email with the heading, “The morel of this story is: It is never too late; never give up.” Definitely, words to live by.